I’ve just finished my series, Autism: Diagnosis, Resources & Therapies. In Step 7, I discussed how to choose the right education for your child with autism. If you chose homeschool, this post is for you. There are six main homeschool approaches – or “styles” – out there. I’m going to very briefly touch on them all just for definition’s sake. If you’re interested in further understanding them, click here. 1. Traditional: This is pretty much school at home. Think text books, schedules, and tests. 2. Classical: A revival of medieval teaching used to educate some of the greatest minds in history. The trivium works children through three stages: grammar, dialectic and rhetoric. 3. Unschooling: This might be called child-led learning or delight-directed, as well. You respond to your child’s interests by basing the curriculum around what he is passionate about. 4. Unit Studies: All subjects are taught through a topical or themed study. 5. Charlotte Mason: Literature-based, rich and vast education on all subjects. 6. Eclectic: A combination of all. I should tell you I’ve dabbled in all of these at some time in our homeschool journey so far. In fact, I’d even say some subjects are better executed with different styles. For instance, it’s pretty standard to learn math from a text book but how cool is it to invite a virtual instructor into your home to teach your kids to play the piano? Literature, in my humble opinion, is meant to be read aloud and savored – not dissected by multiple choice questions. As you can probably guess, there’s no one way to homeschool. In essence, all styles can be eclectic. That being said, I like to think of a homeschool approach as having two parts – a core philosophy with an adaptable delivery. Pick a philosophy you most relate to (not every thing little detail will line up; that’s okay) and be prepared to alter things when necessary. If you’re lucky though and you really find an approach that fits your family, there should be very little adapting to be done. My point is this: don’t ever be more devoted to a philosophy or a curriculum than the person you are educating. 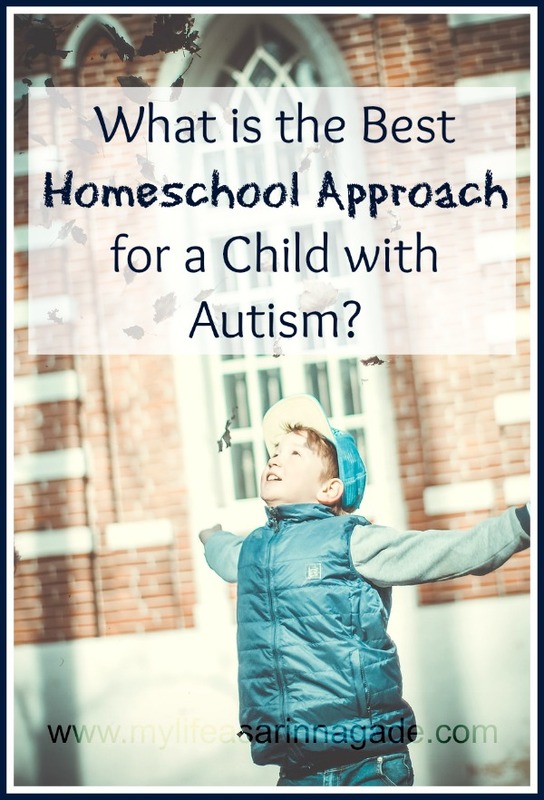 So what’s my pick for the most autism-friendly homeschool approach? As I read through her series, my internal dialogue was screaming, “Yes! Exactly!” and I knew it was a match for us. It was a match not just because we adhere to many of the principles she teaches (like emphasis on living books and classic literature) but also because many of the things we are struggling with at home (like instilling good habits) is built into her approach. So, what is the Charlotte Mason Philosophy? In short, key words like short lessons, free afternoons, narration, living books, twaddle-free literature, nature study, copy work and habit cultivating come to mind. I’m going to go into detail on each one of the topics that define the Charlotte Mason approach over the next few weeks. For the long version, go to Ambleside Online and see how it differs from the other methods. What makes Charlotte Mason the best homeschool approach for a child with autism? Autism is expensive. Supplements. Special Diets. Doctors visits. Therapy. The list goes on. The saying goes, if you have a Bible and a library card, you can do Charlotte Mason. That is not far from the truth. I am seeing the benefit of working in my son’s window. Instead of trying to stretch him beyond his means, short lessons are perfect for him; 10-15 minutes of lessons at a time helps to ensure that I actually have his attention when I am teaching. Character building, social skills and life skills rank high above academics in our home. Autism is not an irreversible diagnosis. Bottom line. There is no “can’t” as in, “my son can’t pay attention for very long…” or “my son can’t do household chores…” or “my son can’t do self-care…”. Combined with The Son-Rise Program, there is no reason you cannot work on good habits with your autistic child and have unlimited hope for him. Just because it may take longer for him (and it probably will), does not mean that it’s impossible. Fine motor skill challenges are very common in children with autism. According to Charlotte Mason’s philosophy, when your child is writing, he should be practicing the habit of excellence in perfecting his handwriting to his best abilities. She cautions against ever writing sloppy so narration is the perfect replacement for test taking and written answers. The Charlotte Mason philosophy comes with its own lingo. To assist with the learning curve, I’ve created this quick guide just for you. Click here and get your copy FREE! What homeschool approach do you find most autism-friendly? Have you heard of Charlotte Mason? Cindy, I’m so glad to have got your wheels turning! We are loving homeschool with our autistic son, especially after being in the school system ( I wrote on what we learned after a year in public school). You are right about your son being more vulnerable and I do believe it’s wise for us to protect our kids from unnecessary growing pains. Never give up hope that he will speak one day! Have you read my post on Autism Breakthrough? So glad you stopped by :). Thank you for writing this article! I never considered homeschooling my autistic son but after reading what you wrote it might make sense for his situation. He is is five years old and nonverbal which makes him vulnerable especially as get gets older. I subscribed to your posts, please keep me updated on how things are going.